Is China’s Market-State Juggernaut Grinding to a Halt? If the Chinese economy is to grow, the presence of the state will have to be reduced. China’s current economic slowdown, including weaker factory growth and the bursting of the property market bubble, has led some analysts to argue that China may be in for a “hard landing.” A recent report by Naoki Kamiyama and David Cui of Bank of America-Merrill Lynch even argues that China’s economic position today is even worse than that of Japan just before the “Lost Decade,” in which Japan lost competitiveness and even the ability to recover. So, what does this mean for China: Does it imply that the exceptional Chinese growth model of a Communist government coupled with a market economy doesn’t work in the long run? If China is indeed in for a hard landing, is its market-state juggernaut grinding to a halt? China’s economy, though market-based, is heavily dependent on the state for obtaining legitimacy, and constraints on state resources therefore limit long-term market expansion. A recent example of this comes from the shadow banking sector. Trust companies, though registered with the state as financial entities, operate under the China Trustee Association, an industry organization responsible for “fulfilling self-discipline.” Though the association complies with laws laid out by the China Banking Regulatory Commission, it does not have the power itself to make laws or to truly enforce standards within the industry. As a result, the China Trustee Association has little authority to promote and protect the trust industry, which has lost its appeal as a number of trust products have faced potential default in recent months. 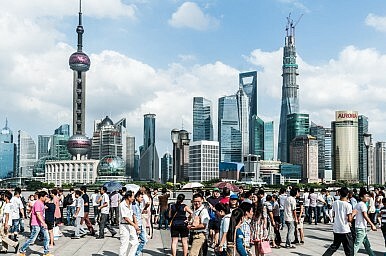 By contrast, the banking sector, which is directly regulated by the China Banking Regulatory Commission and receives supervision and examination from this body, uses more state financial and human resources and has weathered the downturn with more ease due to its direct relationship with the state apparatus. This can also be applied to other cases – for example, a comparison of state owned enterprises with market institutions of varying state association and protection – to illustrate the need for market-based actors to gain legitimacy from the state. The dependence of the market economy on the legitimization by the state is also illustrated by the relatively low level of consumer spending in China. Consumer spending is low because residents save money to cushion themselves from financial shocks resulting from, in large part, high out-of-pocket medical care expenditures. Insufficient health care coverage by the Chinese state has resulted in high out-of-pocket expenditures by patients; therefore, individuals often find themselves responsible for many medical expenses. While private health care may offer better medical care and lower out-of-pocket expenditures for patients, Chinese citizens are unused to market-based social services, and are reluctant to make use of private health insurance, which, again, lacks legitimization by the state. Therefore, until the health care question can be resolved, consumer spending remains constrained. The market economy may better contribute to growth if state legitimacy is not required. The trust sector, if expected and allowed to self-police, may have performed far better. Risks could have been more tightly controlled, trust company management structures could have been improved, and monitoring and auditing could have been implemented. Private health insurance, if trusted by Chinese citizens, could help reduce or at least stabilize out of pocket costs, resulting in an increase in the consumption of other goods. The fact is that there are very real financial and human resource constraints to the government’s involvement in the economy that are now constraining growth. The only long-term solution to bringing about continued growth is to reduce the role of the state, not just in terms of ownership, but also in terms of legitimacy, and promote market-based economic solutions. So in answer to the questions posed, it appears that the market-state juggernaut is grinding to a halt at least in the short run, as the focus of growth is transferred to other sectors, and possibly in the long run, if the state’s presence in reformed sectors also persists. While there are other potential sources of growth, the current sources of growth have been offset to a large degree by the need for the insertion of government power – somewhere, somehow, the power of the state must be reduced to allow China’s economy to expand. Only in this way can the cycle of growth be made persistent.